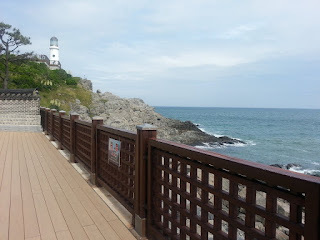 I have been to Busan thrice and would love to visit the city again. Similar to Jeju, it has lovely beaches and fresh seafood. If you need help with your planning or require an itinerary, just leave a comment below with your email. I will try my best to help you find out what you need to know. How to get to Busan from Seoul? The easiest and fastest way to get to Busan is by air. It costs around 70,000 won one way and it takes around 1 hour (one way). A cheaper and fuss free alternative is KTX. One way trip costs 59,800 won and it takes about 2 hours 40 minute. Board from Seoul Station and alight at Busan. The KTX trips are quite frequent and the ride is comfortable. 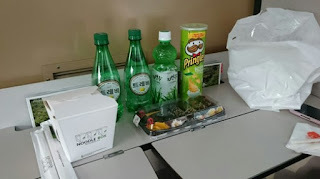 You can buy lots of snack at Seoul station beforehand to last you the entire journey. Once you have reached there, you can either rent a car or take the subway. However, before that, you need to book a hotel. I have introduced this hotel in my Seoul blog post, it is none other than Toyoko Inn Haeundae Busan. There are 5 branches in Busan (they sure are expanding fast). This hotel is cheap and good, provides free breakfast too. If you don't have a car, recommend staying near Busan Station (Toyoko Inn Busan Station No. 1). The KTX from Seoul will bring you to the doorstep of your hotel. If you intend to spend more time at the beach, you can try the Haeundae branch (2 branches there, 1 of them opened on 23 Jan 2016). They are 10 minutes walk from Haeundae subway station though. What to eat in Busan? Our first breakfast will always be to 원조전복죽 (pronounced as won jo jon bok juk), a 24 hour restaurant that sells abalone porridge. It is located in the Pale De Cz building opposite Toyoko Inn Busan Haeundae No. 1. We have gone back to this place thrice, so you know how delicious it is. This costs 12,000 won and is really worth it. Abalone bibimbap which costs same as the porridge. It is about a 15 minute walk from Haeundae Beach subway station. Take exit 5 or 3 and walk towards the beach. Next recommendation, head over to Gukje Market (국제시장) near BIFF. The nearest station is 자갈치역 (Jagalchi station). Take exit 7 and walk down the main road. This is by far, the best spicy rice cake that I have tasted. You can see that the rice cake is different from those you see at road side stalls. It is longer. This is made of rice instead of mixing flour into it. Busan is famous for their rice cake and fish cake. This is purchased from 소문난분식 (pronounced as So Mun Nan Bun Sik). This is somewhat popular in this Busan. It is supposed to be spicy, you can add the chilli sauce to your liking and mix. I don't have a picture of the kimbap but I did order it. It costs 3,000 won for 2 rolls. If you can't find this store, fret not. There is another in the same market that was featured on Korean Culinary Show called 이가네 (pronounced as E Ga Ne). Look for the store with the most people and you probably got it. The shop sells hotdog as well. How can you not eat seafood when you are near the beach? The one we went to is near Gwanganri beach where you get to see night view of Gwangandae bridge. It is located on the 6th floor of the building called 통영횟집 (pronounced as tong yeong hui jib). You can either go for their set menu (highly recommended if you can't speak Korea, just say A/B/C course) or choose your seafood at the first floor (segregated by restaurant) then take the lift with your live seafood in a bucket up to the restaurant. Be sure to ask about the price before you choose. Located in a building right next to the beach. Doesn't look impressive but is fresh and reasonably priced. However, I have other recommendations for seafood (live octopus etc). You can head to 민락횟타운 (pronounced as minrak hui town) and choose their C course (30,000 won for one person). I have not been there before but I have seen many good reviews on naver (reviewed by Koreans). To order, just say "C course juseyo". It consists of abalone, octopus (raw and cooked), sushi, side dishes, steamed egg, one plate of sashimi etc. What to do in Busan? Head to Tae Jong Dae (태종대) park. If you don't have a car, getting there can be tricky. 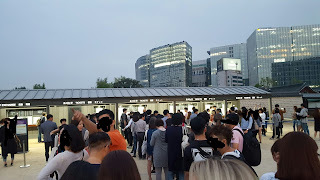 You will have to take the subway (line 1) to Nampodong (남포동), exit from exit 6 and you will find a bus stop. You can either board bus number 8, 30 or 88. It takes about 30 minutes. If boarding from Busan station, take bus 101. You can purchase tickets for train ride (다누비 pronounced as Danubi) that will bring you to a few scenic spots. You can just get on and off at any stops. It costs 2,000 won per person but definitely worth it. Another sightseeing spot you can't miss is the Gwangandaegyo which means Gwangan bridge. Catch the night view of the bridge dazzling with lights. Sometimes, you will see peddlers selling fireworks near the beach. Next, have a walk down Haeundae Dongbaekseom. From Haeundae beach (facing the beach), walk to the right and you will see Chosun Westin Hotel. From there, take the trail that leads to Dongbaekseom. Tired from a day of walking? Head to Shinsege Centum City Spaland to relax. The Spaland is filled with facilities (movie room, rest area, restaurant, sauna) and is nicely done up. It is open from 6am till 12am (last entrance at 10:30pm). Entrance fee is 15,000 won on weekdays and 18,000 won on weekends/public holidays. Each person is limited to stay in there for 4 hours. There is an outdoor area for you to soak your feet. If you need some privacy, you can head to the cubicles at the back of the picture below. Of course, there are lots of places for you to sweat it out. On the to visit list is Haedong Yonggungsa. I think I lost all my pictures taken there. It is actually a temple located on the cliffs. It is quite a scenic spot thus, don't give it a miss even though you are not Buddhist. What to buy in Busan? If you are interested in getting some hanbok, can walk around the market to look for good deal. This was purchased at the market at around SGD50 or so. The real hanbok usually costs much more than this. Hi Jane, Can I have your email address? I've some questions to ask you about KTX to Busan. Many thanks! 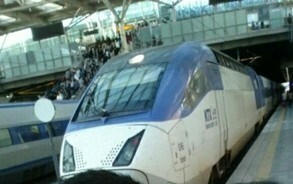 Hi Jane, you mentioned the KTX is 59,800 won (one way trip) from Seoul to Busan. Can I book 1 day pass ticket or more? Hi, Will like to check if i am taking KTX from Seoul to Busan and then back to seoul, will it be more worth it to get the three day pass? How does the three day pass work? Hi, you can refer to the website given in the above comment. You will reach on the first day and leave on the 3rd day? Can consider the flexible 2 day pass as well. You can choose any 2 days, need not be consecutive. For the seafood set, do they charge by per pax or by set? Hi, they charge by per set ordered, 1 set good for 1 person. 2) I googled "민락횟타운 ", seems like it's full of restaurant inside. Do you have any restaurant recommendation? Hi, I do not have itinerary for Busan apart from those I posted in this blog. Is there anything in particular that you are interested in? Hi! Thanks for the useful tips! I'm planning for a trip to Seoul, Busan and Jeju. We are thinking of self-drive in Busan and Jeju. Do you happen to have some recommended self drive itineraries in the two cities? Any particular car rental company you recommend in Busan? Thank you!! Also, how many days would you recommend in Busan? Will 4D3N be too long? Thank you!